Tom Mix is framed as a cattle rustler in this rare and unedited early Western feature. Plus the bonus Tom Mix shorts 'A Bear of a Story' and 'The Stagecoach Driver and the Girl'. Tom Mix was the undisputed "King of the Cowboys" during the early silent era of Western films. Born in Pennsylvania in 1880, Tom headed west early on, mastering horsemanship and serving as Sheriff-Marshal in Dewey, Oklahoma by 1904. He also performed in Wild West shows until he got his first movie job with the Selig Polyscope Company in 1910. After signing with Fox Films in 1917, his fame skyrocketed, eclipsing other stars such as Hoot Gibson and William S. Hart. Along with his famous steed, Tony, Mix was America's quintessential Western hero, and he remained so even after his tragic 1940 death in an Arizona desert car accident. 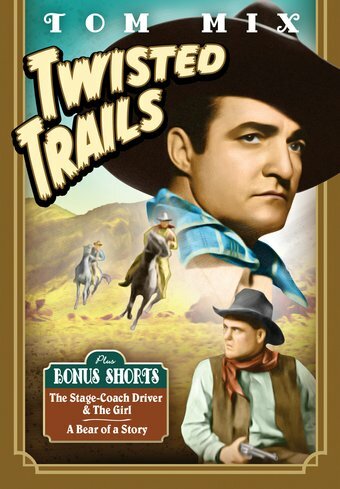 TWISTED TRAILS (1916): Sheep herder Tom Snow is framed for cattle rustling by crooked deputy Brad Foster and his men. Tom chooses to leave town until he can find a way to prove his innocence. While on the lam he rescues a pretty saloon girl from a lascivious attacker. Realizing the injured girl needs medical attention, Tom brings her back to his home – knowing full well that now he must face Foster in a final confrontation. THE STAGE-COACH DRIVER & THE GIRL (1915): Tom plays a stagecoach driver who must bring a shipment of money and a stuck-up schoolmarm into town at the same time. He'll need all of his courage when the stagecoach is beset by bandits. A BEAR OF A STORY (1916): Tom's real-life wife, Vicky Forde, wants a bear for a pet. Finding one in the wild won't be easy for Tom and his pal Sid Jordan.